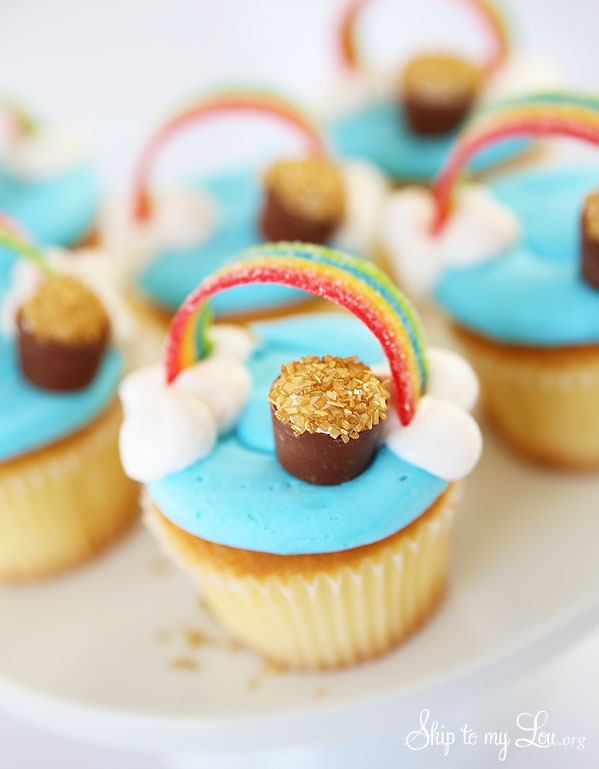 Rainbow cupcakes with a pot of gold are the perfect St Patrick’s Day cupcakes! Fluffy white clouds hold a candy rainbow. Of course, there is a pot of gold at the end of the rainbow. 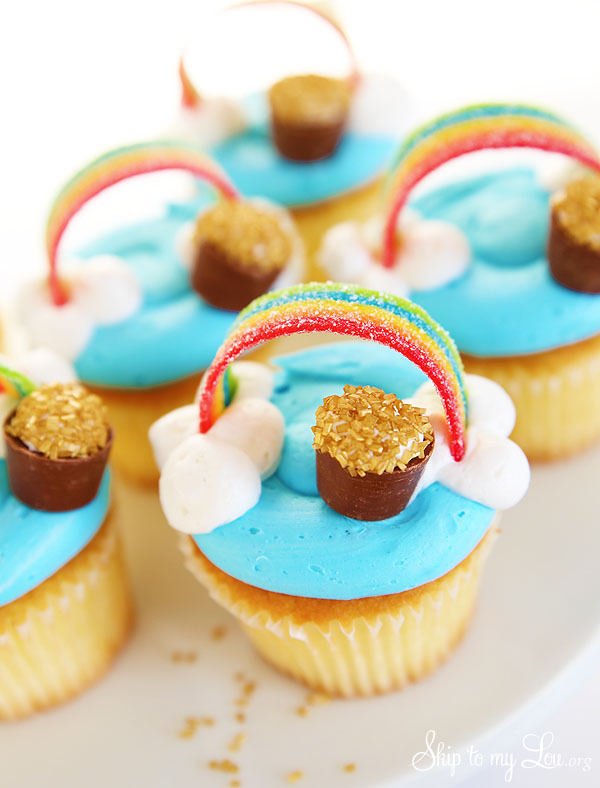 These rainbow cupcakes couldn’t be any simpler with the use of candy to make all the details. 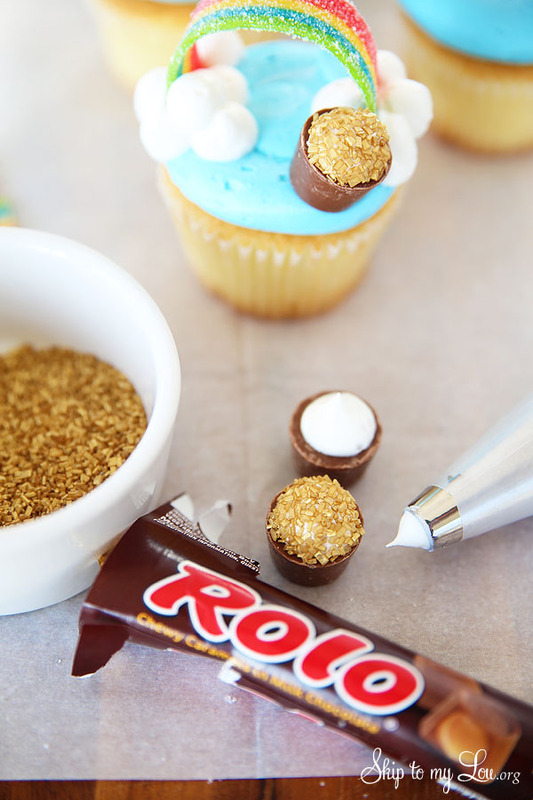 A chocolate Rolo dipped in glittery gold sugar makes the perfect pot of gold. I love to celebrate holidays and have shared some great stuff here at Skip to my Lou for St. Patrick’s Day! Check out my St. Patrick’s Day Printables or this recipe for green popcorn, it’s perfect to munch on! Decorate your house with these crochet shamrocks. You can actually ask your local grocery store to frost cupcakes with blue frosting and no decorations. This will remove a few steps. Then all you need to do is add the white frosting and decorations. If you want to use the frosting in plastic containers form the grocery store you might have to add some powdered sugar to stiffen it up to help it hold the candy rainbow. 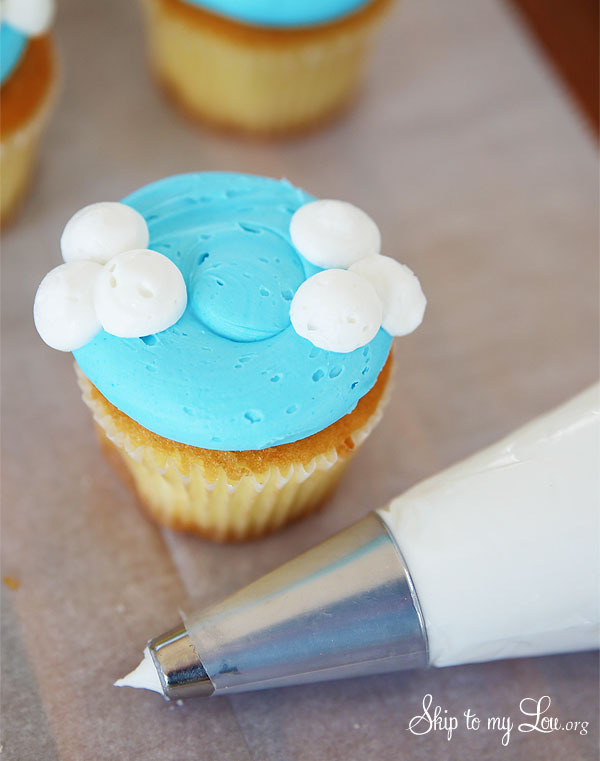 Frost cupcakes with blue frosting. Pipe on fluffy white frosting with a 1/4 to 1/2 inch plain round pastry tip. Frosting needs to be stiff to help keep the candy rainbow in place. 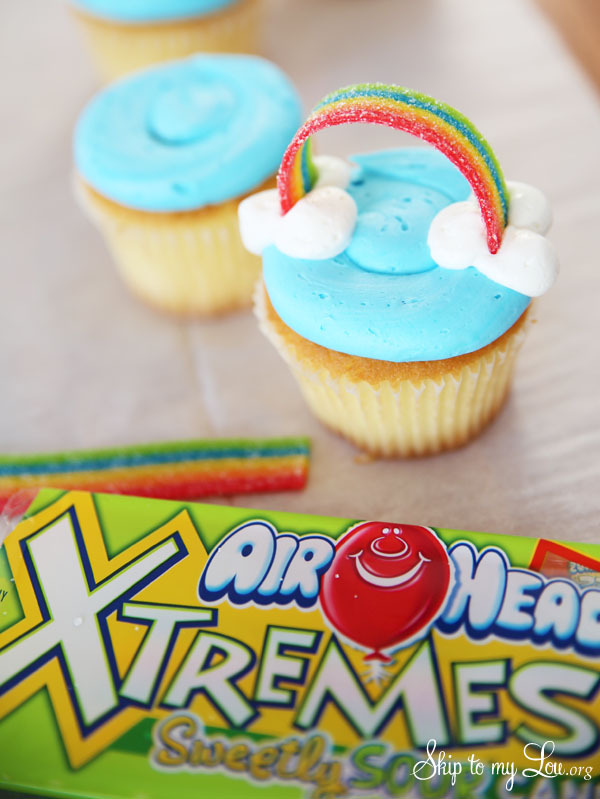 Cut AirHead Extremes in half and place the ends into the white frosting. Add more white frosting if you want extra “clouds”. Be sure to not cut the AirHead rainbow candy too long. This will make a saggy rainbow. Pipe white frosting on the bottom of a Rolo candy. Dip the frosting in gold coarse sugar. Place the candy pop of gold at the end of the rainbow. 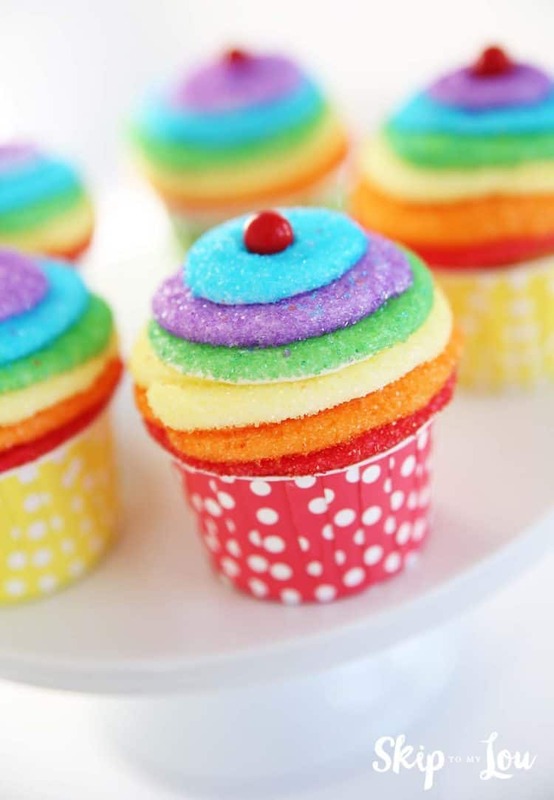 How cute are those rainbow cupcakes? The best part was they are super easy. 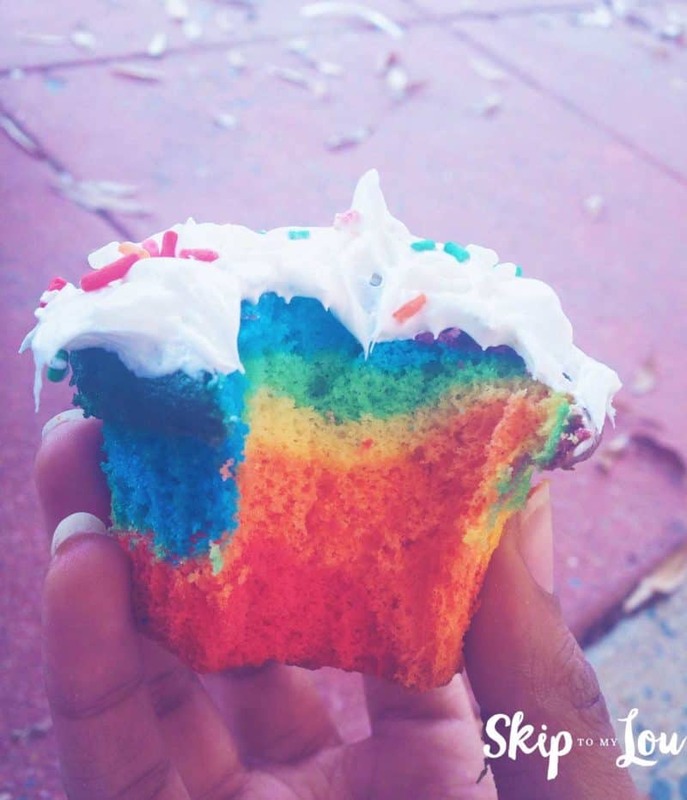 You might also like to see how easy it is to give cupcakes rainbow frosting. Simply dip each layer of frosting in another color of sanding sugar. 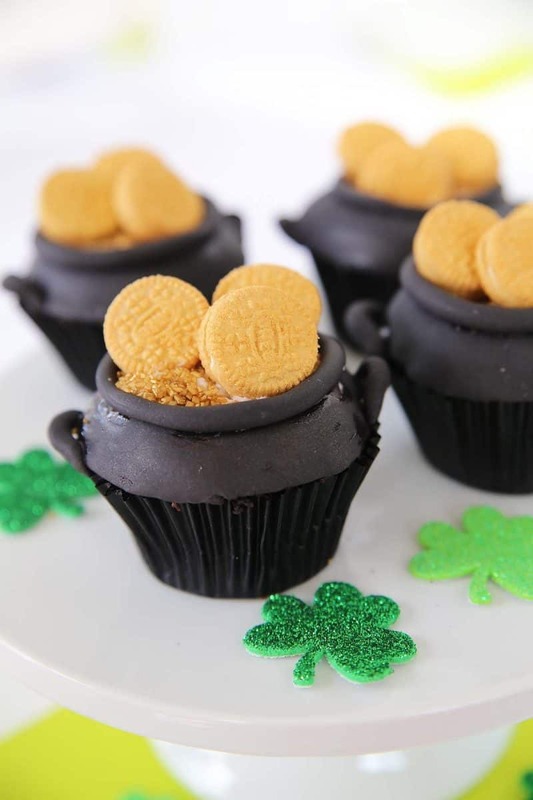 Pot of Gold cupcakes are perfect for St Patrick’s Day. These are gold cupcakes for sure! These actually could be very versatile cupcakes remove the gold and instead add gummy worms and you would have the perfect witches cauldron cupcakes (hehe). If you want the cake rainbow colored it is super easy. to color batter with food coloring. Whip up your own white cake or use a white cake mix. Make sure the batter is light and fluffy. Divide the batter between small bowls. Add a few drops of gel food coloring to each bowl and mix. Fill cupcake liners and bake until a toothpick inserted comes out clean. Here are all the details on how to make marbled rainbow cupcakes. These little rainbow cakes perfect for a birthday party. 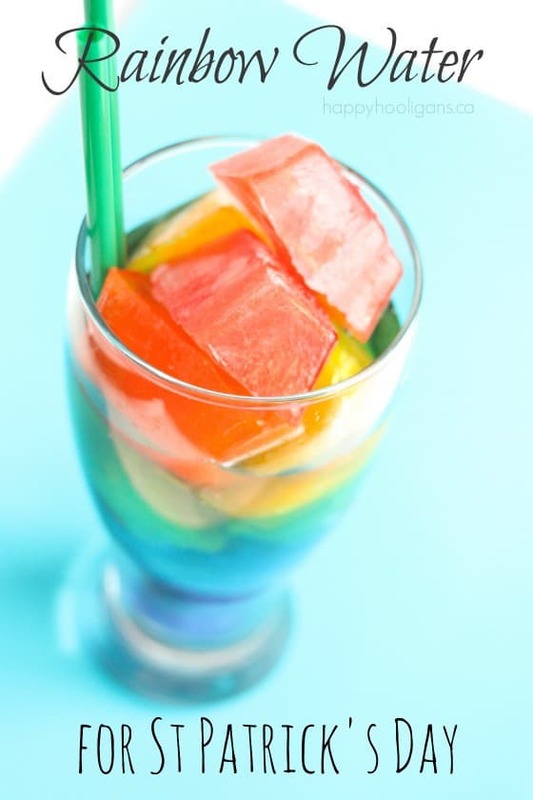 Need more rainbow ideas? 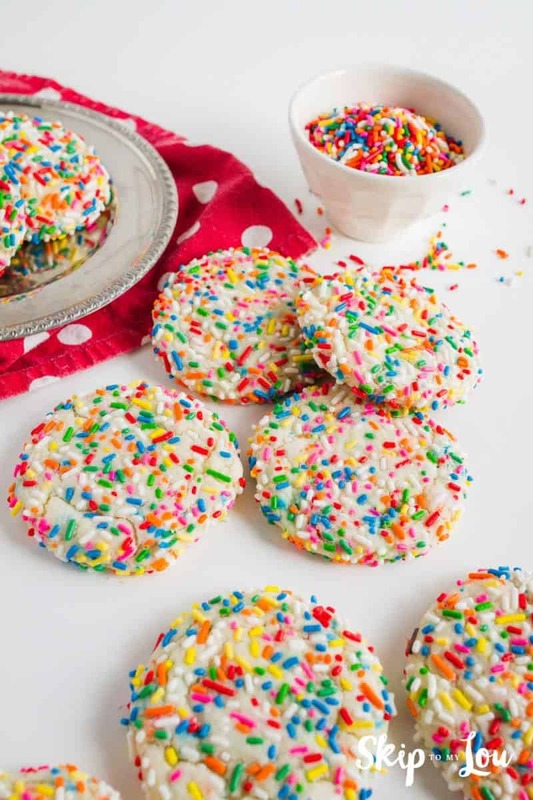 Rainbow sprinkles make these cookies so colorful! The best part these cookies can be made in minutes with the help of a cake mix. 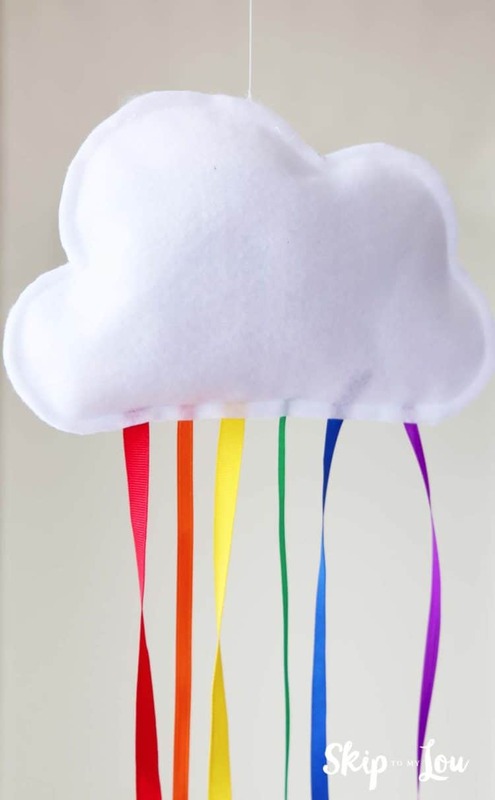 This hanging rainbow cloud is an easy sewing project for kids that will look great hanging in their room. What a sense of satisfaction and pride they will receive. If you didn’t find a bright craft above check out these rainbow crafts. I tried the Rainbow cupcakes with a pot of gold for our St Patrick's bakesale. It was a complete flop, the airheads were to heavy for the cupcakes. The clouds slid off, so I tried to push the airheads into the cupcake a little, this just made a hole. I ended up tossing the airheads added more clouds and put on the pot of gold. They looked ok but was a total waste of time. Bonnie, So sorry! Make sure the cloud frosting is stiff. A homemade buttercream is best. Frosting in the plastic containers at the store is too soft. Also, the airhead doesn't need to be too long. The shorter the better to make it more stable. A reader left a comment that freezing the candy made it stand up. I haven't tried it but that sounds like a great tip. You can also use lucky stripe gum. Hope this helps! Made this last night with a friend...so cute and so easy to decorate for an amateur like me...thank you for sharing!! 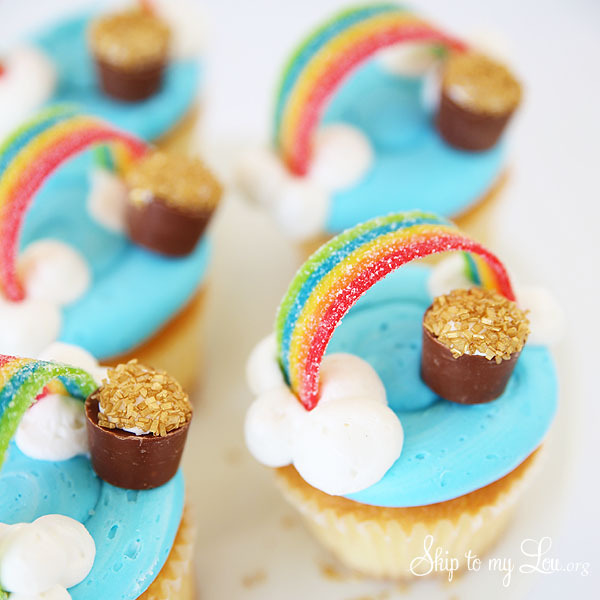 I was wanting to ask if I may use one photo on a rainbow cupcake round up I am doing in March? I will link back to this page. Thanks for your consideration! Taste nice to have a great traditional St Patty's. Thankyou to makers. We can't get over how beautiful these are!! Where do you get gold coarse sugar? I'm from Canada and I'm not sure if I've ever seen this in the store before. Thanks. Made these and just dipped the Rolos in gold glitter from the baking section...looks exactly the same as the pictures above!! These are really cute and easy enough I think I could do this one!